sweetpaprika | FOOD! GLORIOUS FOOD! FROM ONE ENAMORED OF ALL THINGS CULINARY! FOOD! GLORIOUS FOOD! 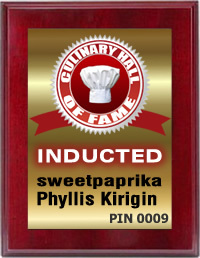 FROM ONE ENAMORED OF ALL THINGS CULINARY! Celebrate Chinese New Year with Potstickers! 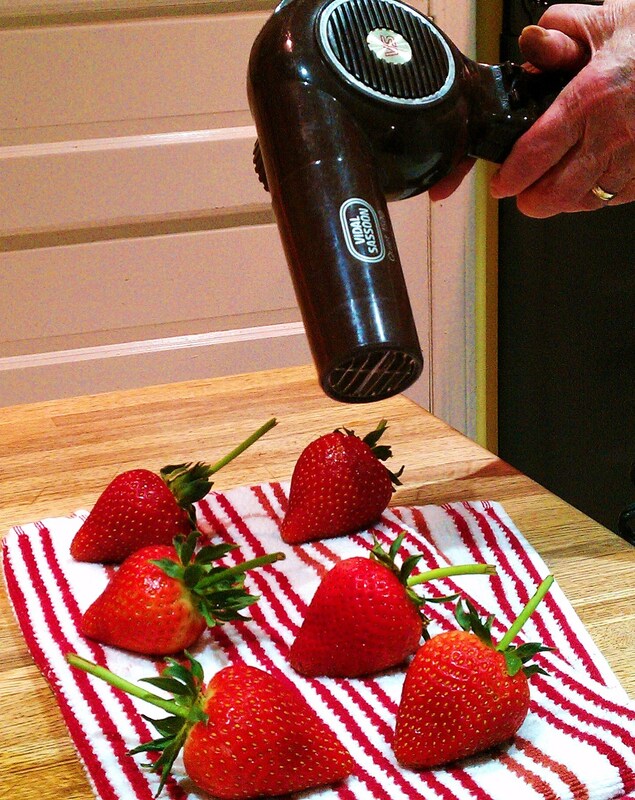 Hand-dipping Strawberries in Chocolate or What’s the Hair Dryer Doing in the Kitchen? Happy Thanksgiving and Thanks for the Memories! Irish Coffee: A Toast to St. Patrick! Scallops on the Half Shell . . . you expected Venus? Stuffed! Stuffing or Dressing–Kick It Up a Bit! The Year of the Dragon is Here! How About Some Potstickers? Will the Real Baby Carrot Please Stand Up? This is the most refreshing cocktail I know. If this doesn’t cool you off on a steamy summer day, I don’t know what will. Notice that the sugar syrup isn’t diluted with water, but grapefruit juice is added. Enjoy! 1. Squeeze juice from 3 red or pink grapefruits, Strain. 2. Heat ¼ cup of juice with ¼ cup sugar until sugar dissolves. Pour back into rest of juice. 5. After a couple of hours scrape through mixture with a fork to break up. Place back in freezer. 7. When a slushy granita forms, scoop into martini glasses. 8. Top with a splash of the grapefruit vodka, strawberry liqueur or prosecco. 9. Garnish with a fresh strawberry. With Thanksgiving upon us, you may well be overwhelmed by so many tips on roasting a turkey. To brine or not to brine? To use an oven roasting bag or just a roasting pan? To stuff or not to stuff? If you have in mind an old-fashioned turkey that is bronzed and succulent, let me add my two cents and suggest a few tips that have worked well for me over the years. 1. As to what size turkey to buy, figure that a 15 pound turkey feeds 10 people with leftovers for those great sandwiches later on. Go from there. 2. If you’ve selected a frozen turkey, thaw it properly in the refrigerator. It will take three days for a 20 pound turkey to thaw. Rinse the turkey with cold water inside and out and pat dry with paper towels. 3. Defrosted turkeys take a little longer to cook than fresh turkeys. Figure 20 minutes per pound for a defrosted turkey and 10 to 15 minutes per pound for a fresh turkey in a 350 degree oven. as celery, carrots, onion, garlic as well as fresh greens like parsley, thyme and tarragon. 5. Tie the legs together with the tail and fold the wing tips under for more even cooking. 6. Before roasting, use your fingers to loosen the breast skin carefully without tearing it. Rub softened butter under the skin and coat the outside of the bird as well. Salt and pepper the bird. The turkey should be placed on a rack in a roasting pan. You can tent the breast with a piece of aluminum foil to make sure it doesn’t brown before the bird is done. Remove it about 45 minutes before the bird is done. 7. You may be tempted to baste the bird, but every time you open the oven door, you lose heat and risk a dry bird. 8. If your bird has a pop-up thermometer, don’t trust it. Use a meat thermometer or instant read thermometer inserted into the thickest part of the turkey. Test the temperature in more than one place including the thickest part of the thigh. When the internal temperature reaches 165 degrees, take the turkey out. Tent loosely with foil for at least 15 minutes before carving. 9. Present your glorious bronzed bird to your guests’ oohs and aahs and then whisk it back to the kitchen to carve. This way you can carve it on a proper cutting board and sneak a piece of crispy skin. Carve your turkey with a very sharp knife. 10. I like Sara Moulton’s carving advice. She suggests pulling the leg back until the joint “pops”. Then cut at the joint to remove the legs and separate them between the drumsticks and thighs. Similarly, the wings can be pulled back and cut at the joint.. The wishbone should be removed with a small sharp knife, thus allowing the breast halves to be easily removed and neatly sliced. An attractive arrangement can then be placed on the serving platter. Bon Appétit! Growing up in an Italian-American family, Thanksgiving wasn’t always about sweet potatoes and green bean casserole for me. It usually began with various antipasti, followed by rich lasagna, and then somewhere along the line we visited the turkey. Almost an afterthought. Sides usually included stuffed mushrooms, fried artichokes hearts – you know, the Italian thing. That changed when my Uncle Angelo married Carol. A young, Irish-American beauty, she was somewhat intimidated by the old country culinary skills of my Mom and Grandmothers. She did, however, possess an impressive knowledge of the all-American Thanksgiving dinner. Hence, this became her holiday. And what a spread she’s laid before us each year since. It was at Aunt Carol’s celebrations that we learned about bread stuffing. My Nonna always prepared this trimming with rice and Italian sausage. Carol’s is all about a chunky bread base and ground pork, enhanced with aromatics such as onions, carrots and celery. She flavors it with parsley and sage, of course, and dots it with various dried fruits. The apricots are my favorites. Very American, and yes, very traditional in most homes across America. It was at Aunt Carol’s home that we were also introduced to the turnip. I remember, one Thanksgiving my Aunt Angelina and Uncle Arturo were in attendance. When the mashed turnips arrived at the table, Aunt Angelina whispered to me “Ma cos’e questo?” Translation, “What’s that? !” One taste and my dear old auntie was hooked. She insisted on the recipe. We also had our first encounter with creamed onions at Carol’s feasts. She always uses fresh, tiny pearl onions. A real chore to peel. But it’s the cream sauce that’s so luxurious. I’ve tried to recreate it, but mine always turns out a bit too watery. One thing is for certain, a grind or two of nutmeg is one of the keys to the depth of this otherwise simple dish. I especially adore the way the cream and bite-size onions lovingly interact with the stuffing on my plate. So sumptuous and no need for gravy, really, when you can enhance your stuffing experience with a bit of cream. Other foreign-to-the-Italian additions at Aunt Carol’s Thanksgiving meals – ones that have become highly anticipated by my family now – include Brussels sprouts. She roasts them in the oven, with just a bit of olive oil, Kosher salt and freshly ground pepper. You know they’re good, because my Mom, who had never tasted a Brussels sprout in her life, now includes them in her special occasion meals. It’s a funny thing, Thanksgiving. A purely American meal that so many cultures have embraced with open arms. And while the Italians might still begin the repast with baked pasta, or the Puerto Ricans need to include a spicy chorizo in the stuffing, the main event most always still features our native Turkey, as well as mashed potatoes and candied yams. Did you ever stop and think about the fact that everyone in our nation is eating more or less the same meal on that last Thursday of November? Quite something, really. Very unifying. And unity, after all, is one of our most prized American traits. Who says the turkey isn’t a smart creature? I think it’s pure genius. Looking for a stunning dessert to top off your Fourth of July cookout? 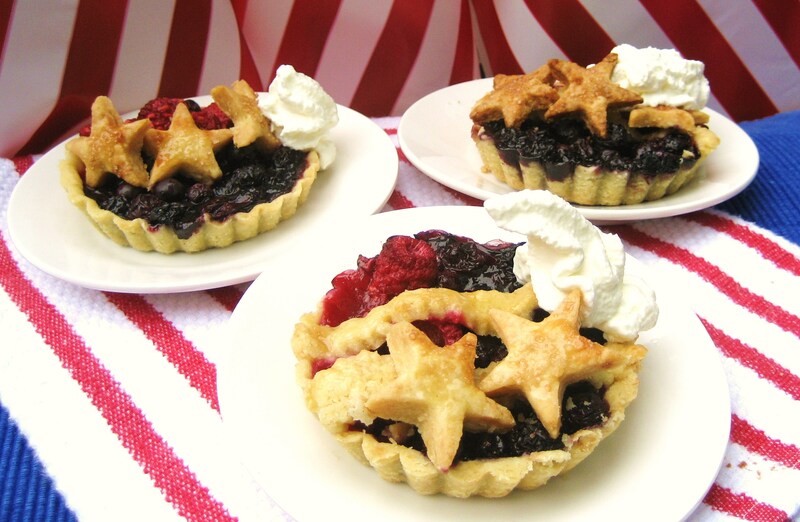 What could be more patriotic than these starry mini berry tarts? Raspberries and blueberries bursting under flaky pastry and adorned with freshly whipped cream assure a grand finale to your celebration. Place flour in the workbowl of a food processor with metal blade. Add salt and sugar and pulse to mix. Add butter and vegetable shortening. Mix using a few quick pulses. You should still see bits of better and shortening. Add egg yolk. Pulse again for one second. Add 3 T ice water around top of dough. Pulse briefly. Continue to add just enough water to allow dough to hold together when pressed between fingers. This is the crucial step. If the dough is too dry it will crumble when you try to roll it out. If you add too much water, the baked crust will not be light and flaky. You should still see tiny bits of butter. Don’t let a ball form. Dump dough onto a sheet of plastic wrap, form into a disk and refrigerate for an hour or more. Roll out pastry dough, one disk at a time, to 1/8 inch thickness. Cut out six circles. Press into tart pans and, using your thumb, press up against inside rims. Place in refrigerator while proceeding. Cut out the number of stars you want for decoration with the star-shaped cookie cutter. These are baked separately from tarts. Brush with milk and sprinkle with raw sugar. Place on a cookie sheet and bake at 350 degrees until golden brown, about 10 minutes. Set aside to cool. Cut a few ½-inch strips of pastry dough with a fluted pastry wheel to use for decoration. 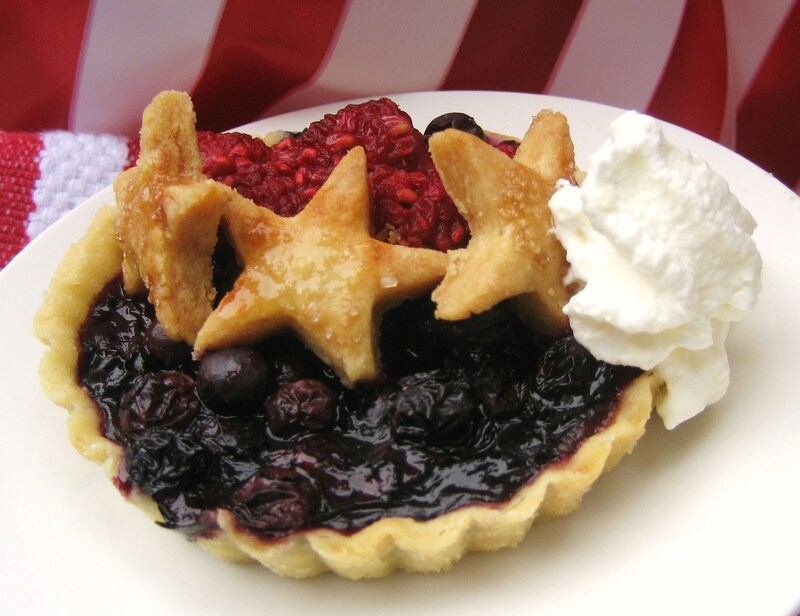 Take tart shells out of refrigerator and fill with berry fillings. You can fill a shell with one filling or two fillings side by side. Dot with bits of butter. Decorate half of tarts with pastry strips arranged in a parallel fashion.. Brush strips with milk and sprinkle with sugar. Set tart tins on an aluminum foil-covered cookie sheet and place in a 375 degree oven for about 45 minutes until crusts are lightly browned and berry filling is bubbling. Arrange the baked star cutouts decoratively on tarts. Remove tins. Top with a dollop of freshly whipped cream. In case you’re already thinking about warding off the winter blues, I bring you the inimitable fragrant and hearty French onion soup. What could better warm your innards than a hot steaming crock of this soul warming ambrosia? Just imagine the creamy melted cheese spilling over the rim of the crock, the crunchy round of French bread underneath and the oniony aroma filling your nostrils. Now it’s only fair to tell you up front that it does take a bit of time to achieve this luscious result. I obviously think it’s worth it. If you want the real thing, prepare to spend a little time in the kitchen keeping an eye on it and stirring from time to time. You can make other preparations at the same time, but don’t leave the kitchen for too long. In a large Dutch oven, sauté bacon over low heat until crisp. Remove bacon strips and add butter to bacon fat. Add the onions and cook slowly about 10 minutes. Stir in the salt, pepper, and sugar and increase the heat to medium. Stir mixture from time to time until the onions turn to a deep amber color, about 90 minutes. If they begin to stick to the bottom of the pot, stir in a little water or white wine. Add garlic. Remove bouquet garni and taste for seasoning. Add salt if necessary. 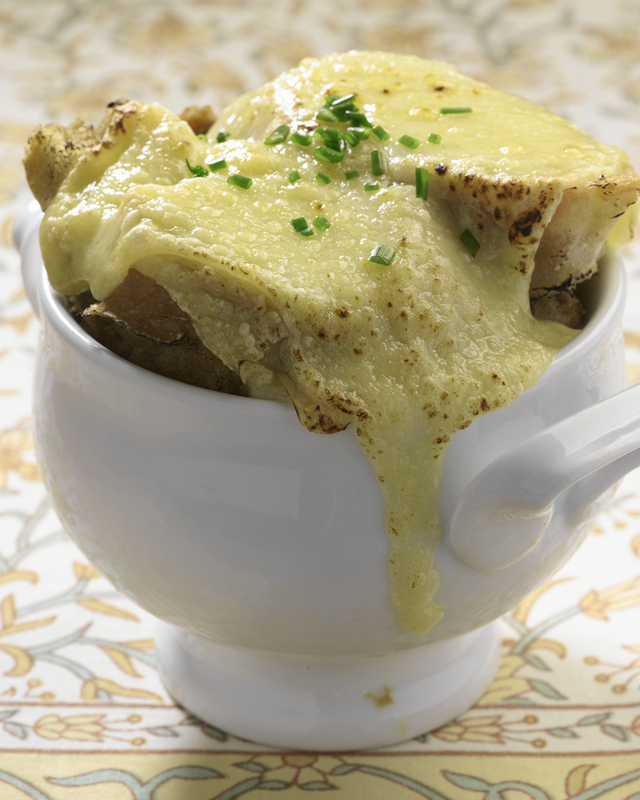 Fill 6 ovenproof crocks, place toasted baguette slices on top and sprinkle generously with cheese. Set crocks on a metal cookie sheet and place under broiler until cheese is melted. Makes 6 servings. *If using canned chicken broth, don’t add salt. I love this time of year. The brisk air hints at cozy evenings on the sofa, and something warm on the dinner table. Like soup. Not the chilled gazpacho you enjoyed in July. I’m talking about the rich, gratifying warmth only a bowl of soup can bring as we enter the colder months. It’s amazing what a satisfying dinner soup can make, especially when served with crusty bread and a salad. Extremely nourishing. Economical, too. I just can’t say enough about it. Growing up, I was treated to an amazing variety of soups. That’s just it about soups. There’s almost no end to the array of recipes for them. Of course, a good chicken soup is always the perfect place to begin. Recipes vary, but they always start with a plump, fresh chicken. Then you build…carrots, onions, celery, potatoes. Almost always present in American versions, with noodles or rice, of course. Add dill and parsnips if you’re going for a Jewish take. And don’t forget to serve with matzo balls or kreplach. Feeling Italian? Add canned plum tomatoes, parsley and a chunk of parmesan rind (it won’t melt as you simmer…promise!) When serving, add some pastina (small pastas like ditalini are perfect) and sprinkle with grated parmesan. Really good for what ails you. Beef soup is outstanding, as well. I use short ribs. After enjoying the soup with noodles, I like to serve the ribs and potatoes (I leave them whole) with a side of salad. The meat falls off the bone and has an indescribable sweetness. A complete meal, for sure. You can also add barley to your beef soup, if you want something that really sticks to your ribs. Vegetable soups really lend themselves to the economical chef. They’re also extremely nutritious. Varied, too. That’s to say that you can take almost any veggie combination and turn it into a satisfying bowl of steaming goodness. Start with a good minestrone, brimming with fresh peas, carrots, onions, beans, tomatoes, potatoes…you name it. Throw in a hand-full of pastina and you’ve got the consummate vegetable soup. I particularly like bean soups. From complex Cuban black bean to hearty Italian bean (pasta e fagioli) to smoky lentil or pea soups (the ham bone does the trick). All outstanding, I think. I also enjoy pureed soups. Potatoes and leaks form a good team in this arena. So do carrots and ginger. Add a touch of heavy cream if you’re daring enough. And speaking of cream, who doesn’t love a substantial bowl of New England clam chowder? I mean, really…does it get any better than that? Now I couldn’t possibly mention every type of soup there is out there. I mean, I haven’t even touched upon Chinese wonton or Japanese miso. I just love them all. However, if I had to choose my all time favorite, I’d have to go with French onion soup. I’ve tasted so many – homemade as well as restaurant prepared. Some using roasted beef bones for the broth. Others depending on the caramelization of onions for the rich, brown color and depth of flavor. Doesn’t matter to me. They’re all exceptional. I believe the cheese is what really gets to me, though. Gooey, slightly browned. I especially love the bits that get stuck on the side of the crock. And what about the surprise within…a crusty (not so soggy, if it’s done correctly) piece of French bread. If that’s not a meal, I don’t know what is. Chilly out tonight? Fill the pot with water or chicken stock and start simmering your own homemade soup. Plan ahead and shop for the ingredients. Or see what you have in the fridge and cupboard. Leftovers are allowed, you know. I mean, use the carcass of last night’s roasted chicken as a base, and create from there. So when the weather calls for soup, you’ll be prepared to answer with a wholesome bowl that will do you good. I think you’ll sleep better that night, too. Weather plays an integral role in working with chocolate as every candy maker knows. And I should know, too. Seems like such a simple thing, dipping strawberries in melted chocolate, and it is if you’re not working in a warm moist kitchen. Who knew that early May would bring such a record-breaking hot humid day? But there I was determined to made a little surprise gift for a few of my friends for Mother’s Day. To get the down side out of the way, the chocolates won’t set up. You’ll have to make space in the fridge. Then, when you box and deliver them, you have to move fast. Tell your friends to refrigerate them and eat them soon. They don’t hold up well. The up side is, of course, they’re utterly delicious and impressive, especially if you find long stemmed strawberries perfectly ripe and use a high quality chocolate. I used Ghirardelli semi-sweet chips. Finely chopped bulk chocolate works even better. Now these gorgeous strawberries have to be washed! There’s the rub. How do you gently wash a strawberry and get it completely dry which you must in order to dip them without messing up your chocolate? This is my aha moment. Dip the strawberries shaking very gently in cold water, lay them out on a clean towel, pat dry (which won’t be dry enough) and then, using a hair blow dryer on a low setting and no heat , dry those babies to the bone. That’s the trick and remember where you heard it. 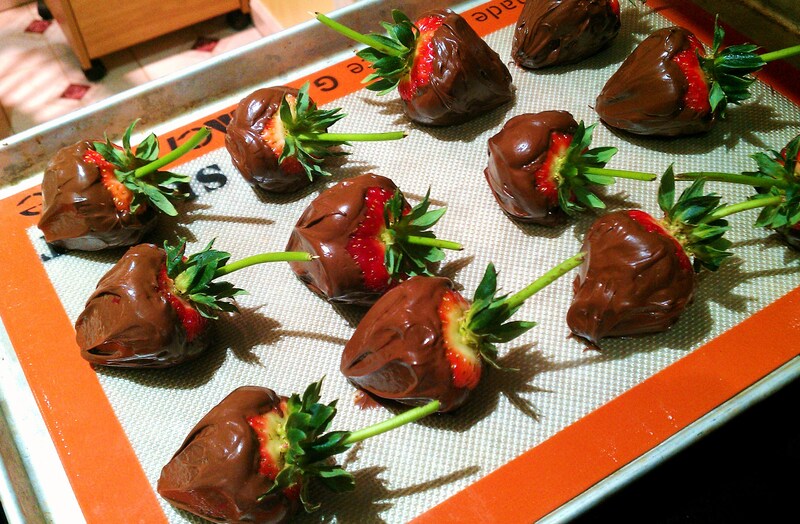 For 12 huge strawberries, I melted one pound of chocolate in the top of a double boiler, over simmering water, but not touching it. I “seeded” the chocolate, adding more pieces to cool it down to a good coating consistency. A little corn syrup can add glossiness. If it needs thinning out, add a little cooking oil and stir, stir, stir. 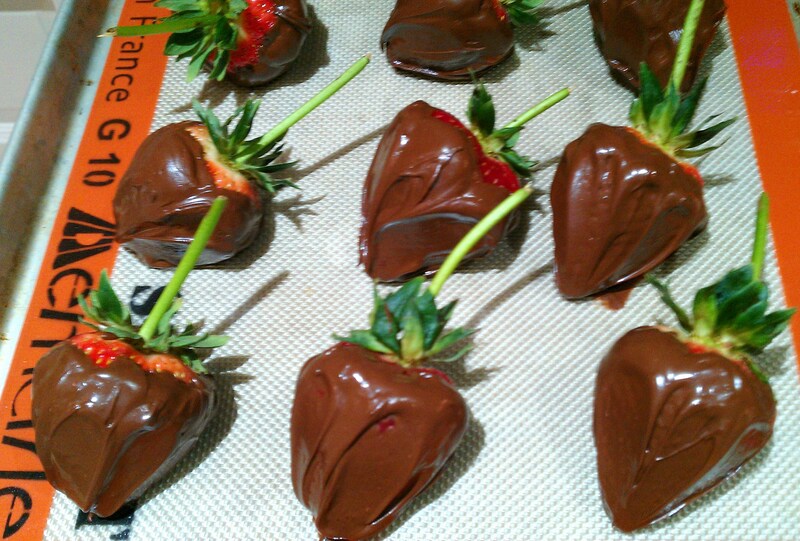 Just hold the strawberries by their stems and spoon the chocolate on letting any excess drip off. Otherwise, you’ll have “feet”. Lay them down on a silpat sheet or parchment paper on a cookie sheet. If your kitchen’s warm, refrigerate. When you’re ready to put your gift together, place each in a paper cup and into a bakery box. Tie up prettily and listen for oohs and aahs. What do you do with that leftover melted chocolate? Use your imagination. I made peanut clusters. He sat on his high director’s chair overseeing his small class of burgeoning cooks, offering instruction in a relaxed, never dogmatic manner. He seemed larger than life, 6’ 2” with noticeably large hands and feet. I watched him knead a ball of dough for two loaves with one hand. I had been on a waiting list to enroll in his classes for 2 ½ years and I was intimidated by him not because of any arrogance, but by who he was. Imagine “the dean of American cookery” and me hanging onto his every word and hoping I wouldn’t do something outrageous like knocking over his large jar of saffron. His manner was, in fact, quite down-to-earth and he only regaled us with his travels and favorite restaurants when someone asked him. The classes were intensive, meeting every night from 5 ‘til around 10. We prepared a complete meal. Mr. Beard selected wine and we all sat down in the dining room of his West 12th Street Village townhouse. One evening he brought out of storage in his wine cellar heavy black baking sheets he’d ordered from France. I still have a set as they are indestructible. I remember as we dined that he didn’t care for coffee, but truly enjoyed good wine. On the Monday night the class began, we began the making of a glace de viande. It started with a beef rump roast tied with a string to the handles of a large stockpot of water but not touching the bottom. After a number of additions and five days of continuous simmering, on Friday night we uncovered about a cupful of ambrosial, thick velvety glace de viande. Every night we made a salad to accompany the evening meal. One night Mr. Beard asked each of us to relate how we made a vinaigrette dressing. Everyone made it a little differently; some added Dijon mustard, some extra virgin olive oil, others a combination of olive oil and peanut oil. What so impressed me was that Mr. Beard, intent on learning something new, was truly listening to each of us. The Cuisinart Food Processor had just become available and, of course, Mr. Beard had a new toy. I remember him experimenting with it, seeing for himself what it could do and not do. It made a mince of meat, he noted, but it couldn’t grind meat. I got my own and wondered how I ever lived without one. It made beautiful baby food. Always present was Mr. Beard’s long time housekeeper and guy Friday, Clay Triplette. Clay was a cook in his own right, a man of interesting heritage, American Indian, Polish and Irish. Clay helped out in the kitchen and seemed to enjoy passing on to students his own recipes and those of other teachers who had taught in Beard’s kitchen. I envied Mr. Beard for his Clay Triplette who whisked away every utensil, bowl or pot that had just been used and promptly washed it and put it away. I have always thought how much easier cooking would be if I had my own Clay Triplette. Today, May 5, is Mr. Beard’s birthday. 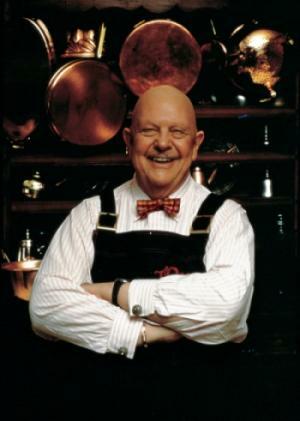 I learned a lot from James Beard, including some techniques that one is seldom called upon to use, such as removing the breast meat from a turkey while keeping the skin intact for a “terrine of the farm.” But it’s nice to know you can do it. Here, however is a more practical recipe he taught me. 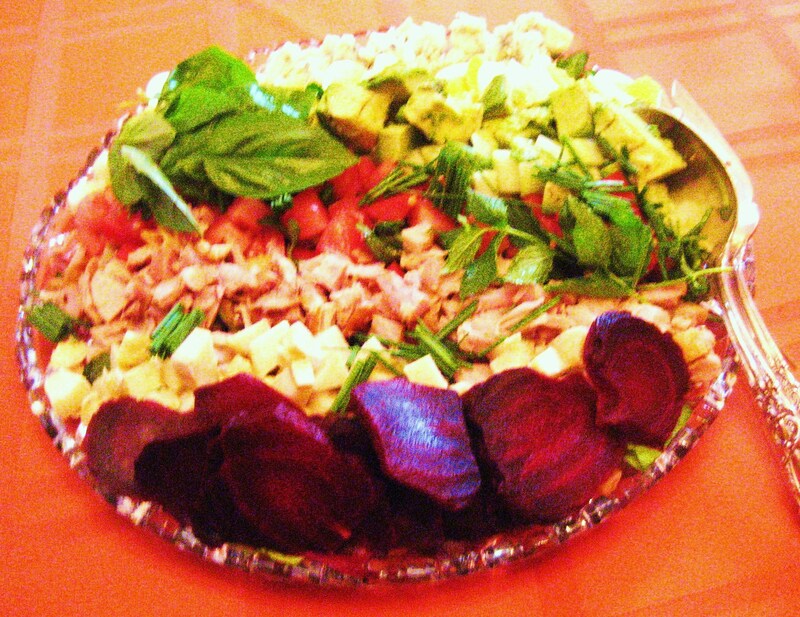 This is an arranged salad with a big wow factor. Whisked unexpectedly to the table, this platter will command gasps of breath with accolades to follow. Prepare a vinaigrette dressing by mincing 2 cloves of garlic and 2 large shallots in a bowl. Whisk in a tablespoon of Dijon mustard and 1/4 cup of a good red wine vinegar. (We used to use Dessaux Fils, but it may no longer be available. Badia a Coltibuono from Italy, both balanced and piquant, is what I use now.) After that is thoroughly incorporated, slowly drizzle in ½ cup extra virgin olive oil and ¼ cup peanut oil. Add ¼ teaspoon freshly ground fresh black pepper and 1 teaspoon kosher salt. Taste and adjust seasoning. Divide the dressing into the number of ingredients you wish to marinate. Add a different herb to each portion keeping in mind how each will enhance the ingredient. For example, finely julienned basil for tomato wedges. Other herbs you might use include oregano, dill, tarragon, mint, savory or chervil. The idea, of course, is to add a complimentary herb to each ingredient and wind up with a variety of flavors. 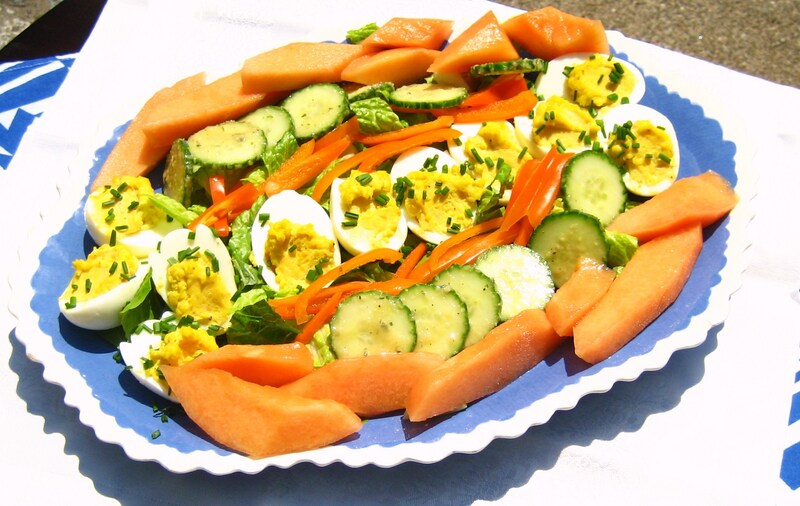 The ingredients are innumerable: roasted peppers, cooked asparagus or string beans, chick peas, tomato wedges, sliced cooked beets, avocado , cucumber, hard cooked egg wedges, salami, tuna, white bean salad, to list a few. 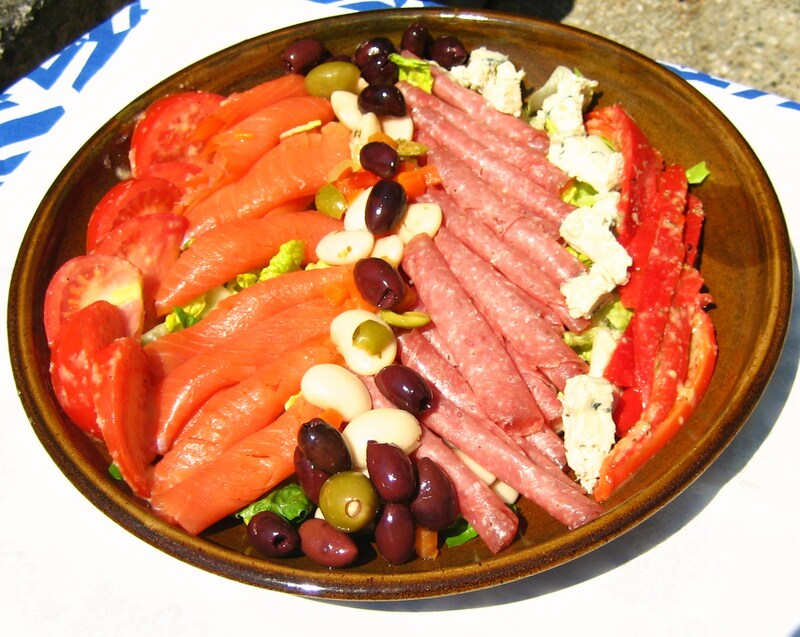 Six or seven items is probably ideal, arranged on a bed of baby romaine or watercress. 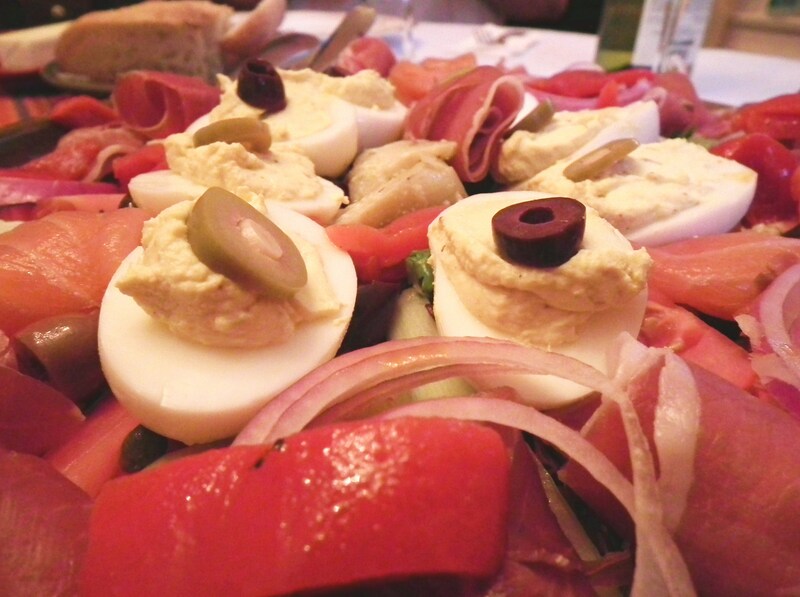 Imported olives, capers, anchovies or caper berries can provide an accent. 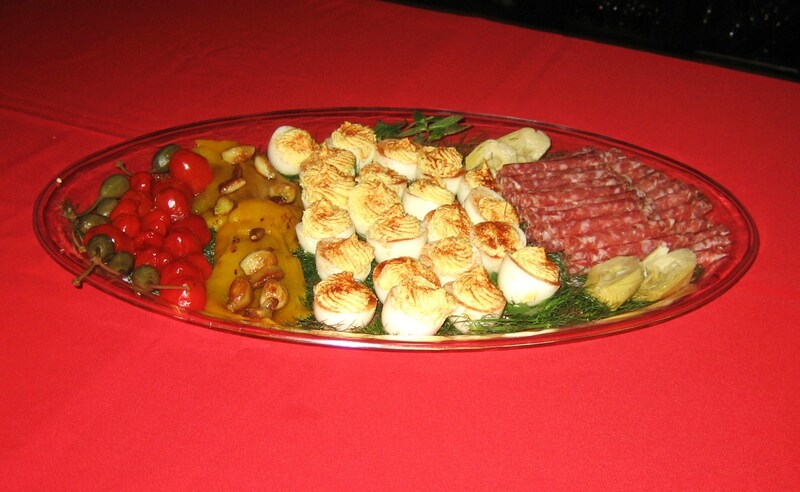 The fun part is turning loose your imagination to arrange your platter. You’ll want to juxtapose contrasting colors and artistically design a round, oval, rectangular or square arrangement or whatever suits your fancy. Bask in your accolades and enjoy! Surprise your guests with this deconstructed version of deliciously addictive nachos. The mouthfeel of the individual ingredients is the wow factor. 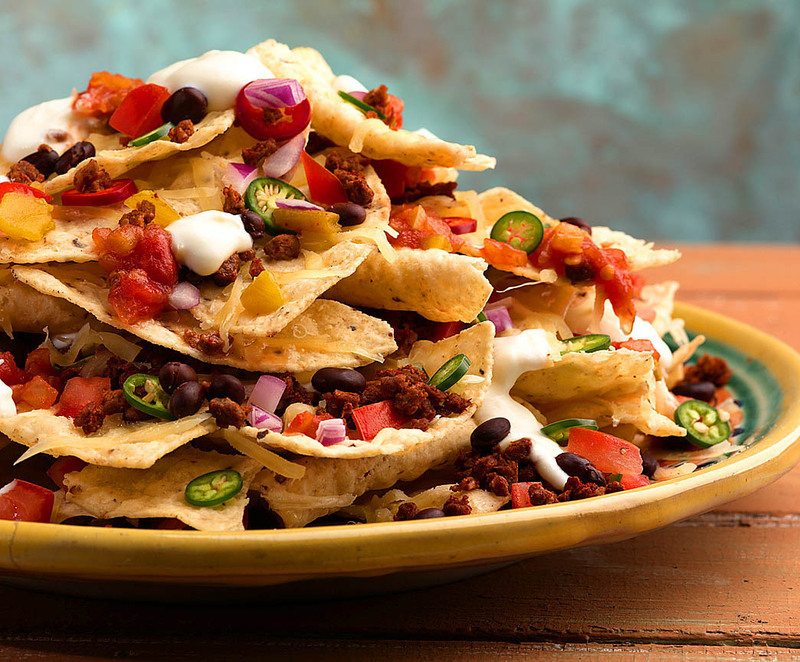 On a large serving platter, arrange layers of corn tortilla chips, black beans, sliced jalapenos, tomato, red onion, sour cream, beef chili and cheddar cheese. In a nonstick frying pan, sauté onion until softened. Add ground beef and garlic stirring together until meat is browned. Pour off excess fat. Add tomato paste, chili powder, cumin, salt and pepper. Cook another two minutes. Add water and cook over medium low heat until water has evaporated, about ten minutes. The Skinny Minnie Cupcake Co.